This article is about the country in the Horn of Africa. For its capital city, see Djibouti (city). For other uses, see Djibouti (disambiguation). Djibouti (/dʒɪˈbuːti/ ( listen) jih-BOO-tee; Afar: Yibuuti, Arabic: جيبوتي‎ Jībūtī, French: Djibouti, Somali: Jabuuti, officially the Republic of Djibouti) is a country located in the Horn of Africa. It is bordered by Eritrea in the north, Ethiopia in the west and south, and Somalia in the southeast. The remainder of the border is formed by the Red Sea and the Gulf of Aden at the east. Djibouti occupies a total area of 23,200 km2 (8,958 sq mi). The state of Djibouti is predominantly inhabited by two ethnic groups, the Somali and the Afar people, the Somalis being the major ethnic group of the country. Djibouti has always been a very active member in the African Union and the Arab League. In antiquity, the territory together with Somalia was part of the Land of Punt. Nearby Zeila, now in Somalia, was the seat of the medieval Adal and Ifat Sultanates. In the late 19th century, the colony of French Somaliland was established following treaties signed by the ruling Somali and Afar sultans with the French and its railroad to Dire Dawa (and later Addis Ababa) allowed it to quickly supersede Zeila as the port for southern Ethiopia and the Ogaden. It was subsequently renamed to the French Territory of the Afars and the Issas in 1967. A decade later, the Djiboutian people voted for independence. This officially marked the establishment of the Republic of Djibouti, named after its capital city. Djibouti joined the United Nations the same year, on 20 September 1977. In the early 1990s, tensions over government representation led to armed conflict, which ended in a power-sharing agreement in 2000 between the ruling party and the opposition. Djibouti is a multi-ethnic nation with a population of over 942,333 inhabitants. Somali, Arabic and French are the country's three official languages. About 94% of residents adhere to Islam, which is the official religion and has been predominant in the region for more than a thousand years. 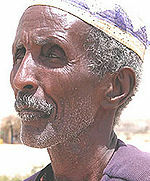 The Somali (Issa clan) and Afar make up the two largest ethnic groups. Both speak Afroasiatic languages. Djibouti is strategically located near some of the world's busiest shipping lanes, controlling access to the Red Sea and Indian Ocean. It serves as a key refuelling and transshipment center, and is the principal maritime port for imports from and exports to neighboring Ethiopia. A burgeoning commercial hub, the nation is the site of various foreign military bases, including Camp Lemonnier. The Intergovernmental Authority on Development (IGAD) regional body also has its headquarters in Djibouti City. Djibouti is officially known as the Republic of Djibouti. In local languages it is known as Yibuuti (in Afar), جيبوتي, Jībūtī (in Arabic), and Jabuuti (in Somali). The name of the country is derived from the city of Djibouti, the epynomous country's capital. The etymology of the city of Djibout is disputed. Several theories and legends exist regarding its origin, varying based on ethnicity. One theory derives it from the Afar word gabouti, meaning "plate", possibly referring to the geographical features of the area. Another connects it to gabood, meaning "upland/plateau". From 1862 until 1894, the land to the north of the Gulf of Tadjoura was called "Obock". Under French administration, from 1883 to 1967 the area was known as French Somaliland (French: Côte française des Somalis), and from 1967 to 1977 as the French Territory of the Afars and the Issas (French: Territoire français des Afars et des Issas). 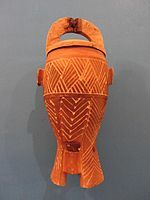 Geometric design pottery found in Asa Koma. Djibouti area has been inhabited since the Neolithic. According to linguists, the first Afroasiatic-speaking populations arrived in the region during this period from the family's proposed urheimat ("original homeland") in the Nile Valley, or the Near East. Other scholars propose that the Afroasiatic family developed in situ in the Horn, with its speakers subsequently dispersing from there. Prehistoric rock art and tombs in Djibouti. Pottery predating the mid-2nd millennium has been found at Asa Koma, an inland lake area on the Gobaad Plain. The site's ware is characterized by punctate and incision geometric designs, which bear a similarity to the Sabir culture phase 1 ceramics from Ma'layba in Southern Arabia. Long-horned humpless cattle bones have likewise been discovered at Asa Koma, suggesting that domesticated cattle were present by around 3,500 years ago. Rock art of what appear to be antelopes and a giraffe are also found at Dorra and Balho. Handoga, dated to the fourth millennium BP, has in turn yielded obsidian microliths and plain ceramics used by early nomadic pastoralists with domesticated cattle. Additionally, between Djibouti City and Loyada are a number of anthropomorphic and phallic stelae. The structures are associated with graves of rectangular shape that are flanked by vertical slabs, as also found in central Ethiopia. The Djibouti-Loyada stelae are of uncertain age, and some of them are adorned with a T-shaped symbol. Together with northern Somalia, Eritrea and the Red Sea coast of Sudan, Djibouti is considered the most likely location of the territory known to the Ancient Egyptians as Punt (or Ta Netjeru, meaning "God's Land"). The first mention of the Land of Punt dates to the 25th century BC. The Puntites were a nation of people who had close relations with Ancient Egypt during the reign of the 5th dynasty Pharaoh Sahure and the 18th dynasty Queen Hatshepsut. According to the temple murals at Deir el-Bahari, the Land of Punt was ruled at that time by King Parahu and Queen Ati. Through close contacts with the adjacent Arabian Peninsula for more than 1,000 years, the Somali and Afar ethnic groups in the region became among the first populations on the continent to embrace Islam. The Ifat Sultanate was a Muslim medieval kingdom in the Horn of Africa. Founded in 1285 by the Walashma dynasty, it was centered in Zeila. 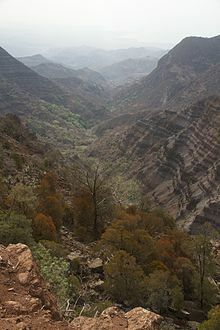 Ifat established bases in Djibouti and northern Somalia, and from there expanded southward to the Ahmar Mountains. Its Sultan Umar Walashma (or his son Ali, according to another source) is recorded as having conquered the Sultanate of Shewa in 1285. Taddesse Tamrat explains Sultan Umar's military expedition as an effort to consolidate the Muslim territories in the Horn, in much the same way as Emperor Yekuno Amlak was attempting to unite the Christian territories in the highlands during the same period. These two states inevitably came into conflict over Shewa and territories further south. 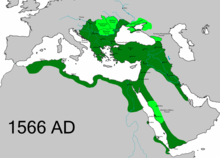 A lengthy war ensued, but the Muslim sultanates of the time were not strongly unified. 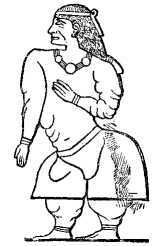 Ifat was finally defeated by Emperor Amda Seyon I of Ethiopia in 1332, and withdrew from Shewa. The Ottoman Eyalet in 1566. Governor Abou Baker ordered the Egyptian garrison at Sagallo to retire to Zeila. The cruiser Seignelay reached Sagallo shortly after the Egyptians had departed. French troops occupied the fort despite protests from the British Agent in Aden, Major Frederick Mercer Hunter, who dispatched troops to safeguard British and Egyptian interests in Zeila and prevent further extension of French influence in that direction. On 14 April 1884 the Commander of the patrol sloop L'Inferent reported on the Egyptian occupation in the Gulf of Tadjoura. The Commander of the patrol sloop Le Vaudreuil reported that the Egyptians were occupying the interior between Obock and Tadjoura. Emperor Yohannes IV of Ethiopia signed an accord with Great Britain to cease fighting the Egyptians and to allow the evacuation of Egyptian forces from Ethiopia and the Somalia littoral. The Egyptian garrison was withdrawn from Tadjoura. Léonce Lagarde deployed a patrol sloop to Tadjoura the following night. From 1862 until 1894, the land to the north of the Gulf of Tadjoura was called Obock and was ruled by Somali and Afar Sultans, local authorities with whom France signed various treaties between 1883 and 1887 to first gain a foothold in the region. In 1894, Léonce Lagarde established a permanent French administration in the city of Djibouti and named the region French Somaliland. It lasted from 1896 until 1967, when it was renamed the Territoire Français des Afars et des Issas (TFAI) ("French Territory of the Afars and the Issas"). In 1958, on the eve of neighboring Somalia's independence in 1960, a referendum was held in Djibouti to decide whether to remain with France or to join the Somali Republic. The referendum turned out in favour of a continued association with France, partly due to a combined yes vote by the sizable Afar ethnic group and resident Europeans. There were also allegations of widespread vote rigging. The majority of those who had voted no were Somalis who were strongly in favour of joining a united Somalia as had been proposed by Mahmoud Harbi, Vice President of the Government Council. Harbi was killed in a plane crash two years later. An aerial view of Djibouti City, the capital of Djibouti. In 1967, a second plebiscite was held to determine the fate of the territory. Initial results supported a continued but looser relationship with France. Voting was also divided along ethnic lines, with the resident Somalis generally voting for independence, with the goal of eventual union with Somalia, and the Afars largely opting to remain associated with France. The referendum was again marred by reports of vote rigging on the part of the French authorities. In 1976, members of the Front de Libération de la Côte des Somalis also clashed with the Gendarmerie National Intervention Group over a bus hijacking en route to Loyada. Shortly after the plebiscite was held, the former Côte française des Somalis (French Somaliland) was renamed to Territoire français des Afars et des Issas. In 1977, a third referendum took place. A landslide 98.8% of the electorate supported disengagement from France, officially marking Djibouti's independence. Hassan Gouled Aptidon, a Somali politician who had campaigned for a yes vote in the referendum of 1958, eventually wound up as the nation's first president (1977–1999). During its first year, Djibouti joined the Organization of African Unity (now the African Union), the Arab League and United Nations. In 1986, the nascent republic was also among the founding members of the Intergovernmental Authority on Development regional development organization. In the early 1990s, tensions over government representation led to armed conflict between Djibouti's ruling People's Rally for Progress (PRP) party and the Front for the Restoration of Unity and Democracy (FRUD) opposition group. The impasse ended in a power-sharing agreement in 2000. Djibouti is a unitary presidential republic, with executive power resting in the presidency, which is by turn dominant over the cabinet, and legislative power in both the government and the National Assembly. 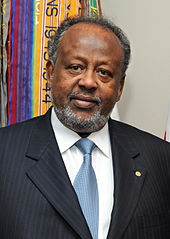 President of Djibouti, Ismaïl Omar Guelleh. The President, currently Ismaïl Omar Guelleh, is the prominent figure in Djiboutian politics; the head of state and commander-in-chief. The President exercises their executive power assisted by their appointee, the Prime Minister, currently Abdoulkader Kamil Mohamed. The Council of Ministers (cabinet) is responsible to and presided over by the President. The judicial system consists of courts of first instance, a High Court of Appeal, and a Supreme Court. The legal system is a blend of French civil law and customary law (Xeer) of the Somali and Afar peoples. The National Assembly (formerly the Chamber of Deputies) is the country's legislature, consisting of 65 members elected every five years. Although unicameral, the Constitution provides for the creation of a Senate. 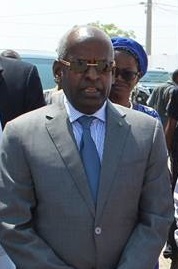 Abdoulkader Kamil Mohamed, Prime Minister of Djibouti. The last election was held on 22 February 2013. Djibouti has a dominant-party system, with the People's Rally for Progress (RPP) controlling the legislature and the executive since its foundation in 1979 (the party currently rules as a part of the Union for a Presidential Majority, which currently holds a supermajority of seats). Opposition parties are allowed (limited) freedom, but the main opposition party, the Union for National Salvation, boycotted the 2005 and 2008 elections, citing government control of the media and repression of the opposition candidates. The government is dominated by the Somali Issa Dir clan, who enjoy the support of the Somali clans, especially the Gadabuursi Dir clan. The country emerged from a decade-long civil war at the end of the 1990s, with the government and the Front for the Restoration of Unity and Democracy (FRUD) signing a peace treaty in 2000. Two FRUD members subsequently joined the cabinet, and beginning with the presidential elections of 1999, the FRUD has campaigned in support of the RPP. Djibouti's current president, Guelleh, succeeded Hassan Gouled Aptidon in office in 1999. Guelleh was sworn in for his second six-year term after a one-man election on 8 April 2005. He took 100% of the votes in a 78.9% turnout. In early 2011, the Djiboutian citizenry took part in a series of protests against the long-serving government, which were associated with the larger Arab Spring demonstrations. Guelleh was re-elected to a third term later that year, with 80.63% of the vote in a 75% turnout. Although opposition groups boycotted the ballot over changes to the constitution permitting Guelleh to run again for office, international observers from the African Union generally described the election as free and fair. On 31 March 2013, Guelleh replaced long-serving Prime Minister Dilleita Mohamed Dilleita with former president of the Union for a Presidential Majority (UMP) Abdoulkader Kamil Mohamed. In December 2014, the ruling Union for the Presidential Majority also signed a framework agreement with the Union of National Salvation coalition, which paves the way for opposition legislators to enter parliament and for reformation of the national electoral agency. The Djibouti National Assembly in Djibouti City. Foreign relations of Djibouti are managed by the Djiboutian Ministry of Foreign Affairs and International Cooperation. Djibouti maintains close ties with the governments of Somalia, Ethiopia, France and the United States. Ties with Somalia are especially close, as Djiboutian Somalis often identify themselves with their brethren to the south. Relations with Eritrea are tense due to territorial claims over the Ras Doumeira peninsula. Since the 2000s, the Djiboutian authorities have strengthened ties with China. Djibouti is likewise an active participant in Arab League and African Union affairs. In its 2011 Freedom in the World report, Freedom House ranked Djibouti as "Not Free", a downgrading from its former status as "Partly Free". There are occasional reports of police beating prisoners. Reporters Without Borders claims that Dirir Ibrahim Bouraleh died from injuries sustained under torture by Sergeant Major Abdourahman Omar Said from 23–27 April 2011. Conditions in the jails are considered worse, with no formal system of care. Security forces frequently make illegal arrests. Jean-Paul Noel Abdi, president of the Djiboutian League of Human Rights, was arrested on 9 February 2011 after reporting on opposition protests in connection with the Arab Spring earlier that month. According to Human Rights Watch, he did not support the protests themselves but objected to what he described as arbitrary arrests. He was later released on health grounds but the charges remain. Maryama base during a martial exercise in the Arta Region. The Djibouti Armed Forces include the Djibouti National Army, which consists of the Coastal Navy, the Djiboutian Air Force (Force Aerienne Djiboutienne, FAD), and the National Gendarmerie (GN). As of 2011[update], the manpower available for military service was 170,386 males and 221,411 females aged 16 to 49. Djibouti spent over US$36 million annually on its military as of 2011[update] (141st in the SIPRI database). After independence, Djibouti had two regiments commanded by French officers. In the early 2000s, it looked outward for a model of army organization that would best advance defensive capabilities by restructuring forces into smaller, more mobile units instead of traditional divisions. The first war which involved the Djiboutian Armed Forces was the Djiboutian Civil War between the Djiboutian government, supported by France, and the Front for the Restoration of Unity and Democracy (FRUD). The war lasted from 1991 to 2001, although most of the hostilities ended when the moderate factions of FRUD signed a peace treaty with the government after suffering an extensive military setback when the government forces captured most of the rebel-held territory. A radical group continued to fight the government, but signed its own peace treaty in 2001. The war ended in a government victory, and FRUD became a political party. As the headquarters of the IGAD regional body, Djibouti has been an active participant in the Somali peace process, hosting the Arta conference in 2000. Following the establishment of the Federal Government of Somalia in 2012, a Djibouti delegation also attended the inauguration ceremony of Somalia's new president. In recent years, Djibouti has improved its training techniques, military command and information structures and has taken steps to becoming more self-reliant in supplying its military to collaborate with the United Nations in peacekeeping missions, or to provide military help to countries that officially ask for it. Now deployed to Somalia and Sudan. Djibouti's strategic location by the Bab-el-Mandeb Strait, which separates the Gulf of Aden from the Red Sea and controls the approaches to the Suez Canal, has made it a desirable location for foreign military bases. Camp Lemonnier was abandoned by the French and later leased to the United States Central Command in 2001; the lease was renewed in 2014 for another 20 years. The 13th Demi-Brigade of the French Foreign Legion is still stationed in Djibouti as the largest French military presence abroad, the only one commanded by a 3-star general. The country also hosts the only overseas Chinese support base and the only overseas Japanese military base. The Italian National Support Military Base is also located in Djibouti. The hosting of foreign military bases is an important part of Djibouti's economy. The United States pays $63 million a year to rent Camp Lemonnier, France and Japan each pay about $30 million a year, and China pays $20 million a year. The lease payments added up to more than 5% of Djibouti's GDP of US$2.3 billion in 2017. China has, in recent times, stepped up its military presence in Africa, with ongoing plans to secure an even greater military presence in Djibouti specifically. China's presence in Djibouti is tied to strategic ports to ensure the security of Chinese assets. Djibouti's strategic location makes the country prime for an increased military presence. A map of Djibouti's regions. Djibouti is partitioned into six administrative regions, with Djibouti city representing one of the official regions. It is further subdivided into twenty districts. 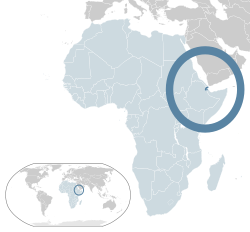 Djibouti is situated in the Horn of Africa on the Gulf of Aden and the Bab-el-Mandeb, at the southern entrance to the Red Sea. It lies between latitudes 10° and 13°N and longitudes 41° and 44°E, at the tripoint of the Somali Plate, African Plate and Arabian Plate. The country's coastline stretches 177 kilometres (110 miles), with terrain consisting mainly of plateau, plains and highlands. Djibouti has a total area of 23,200 square kilometres (9,000 sq mi). Its borders extend 528 km (328 mi), 125 km (78 mi) of which are shared with Eritrea, 342 km (213 mi) with Ethiopia, and 61 km (38 mi) with Somalia. Djibouti is the southernmost country on the Arabian Plate. 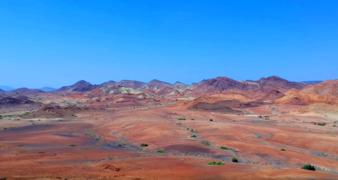 Djibouti has eight mountain ranges with peaks of over 1,000 metres (3,300 feet). 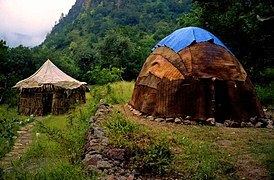 The Mousa Ali range is considered the country's highest mountain range, with the tallest peak on the border with Ethiopia and Eritrea. It has an elevation of 2,028 metres (6,654 feet). The Grand Bara desert covers parts of southern Djibouti in the Arta, Ali Sabieh and Dikhil regions. The majority of it sits at a relatively low elevation, below 1,700 feet (520 metres). Extreme geographic points include: to the north, Ras Doumera and the point at which the border with Eritrea enters the Red Sea in the Obock Region; to the east, a section of the Red Sea coast north of Ras Bir; to the south, a location on the border with Ethiopia west of the town of As Ela; and to the west, a location on the frontier with Ethiopia immediately east of the Ethiopian town of Afambo. Most of Djibouti is part of the Ethiopian xeric grasslands and shrublands ecoregion. The exception is an eastern strip located along the Red Sea coast, which is part of the Eritrean coastal desert. Djibouti map of Köppen climate classification. Djibouti's climate is significantly warmer and has significantly less seasonal variation than the world average. Mean daily maximum temperatures range from 32 to 41 °C (90 to 106 °F), except at high elevations, where the effects of a cold offshore current can be felt. In Djibouti city, for instance, average afternoon highs range from 28 to 34 °C (82 to 93 °F) in April. Nationally, mean daily minimums usually vary from 15 to 30 °C (59 to 86 °F). The greatest range in climate occurs in eastern Djibouti, where temperatures sometimes surpass 41 °C (106 °F) in July on the littoral plains and the freezing point during December in the highlands. In this region, relative humidity ranges from about 40% in the mid-afternoon to 85% at night, changing somewhat according to the season. Djibouti's climate ranges from arid in the northeastern coastal regions to semiarid in the central, northern, western and southern parts of the country. On the eastern seaboard, annual rainfall is less than 5 inches (131 mm); in the central highlands, precipitation is about 8 to 16 inches (200 to 400 mm). The hinterland is significantly less humid than the coastal regions. The coast has the mildest climates in Djibouti. The 2015 Djibouti climate change bill has set a goal for the country to generate 100% of its energy from clean renewable energy sources by 2020. 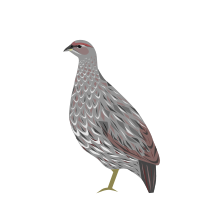 The Djibouti francolin, a critically endangered species living only in Djibouti. The country's flora and fauna live in a harsh landscape with forest accounting for less than one percent of the total area of the country. Wildlife is spread over three main regions, namely from the northern mountain region of the country to the volcanic plateaux in its southern and central part and culminating in the coastal region. Plant species on the Forêt du Day National Park. Most species of wildlife are found in the northern part of the country, in the ecosystem of the Day Forest National Park. At an average altitude of 1,500 metres (4,921 feet), the area includes the Goda massif, with a peak of 1,783 m (5,850 ft). It covers an area of 3.5 square kilometres (1 sq mi) of Juniperus procera forest, with many of the trees rising to 20 metres (66 feet) height. This forest area is the main habitat of the endangered and endemic Djibouti francolin (a bird), and another recently noted vertebrate, Platyceps afarensis (a colubrine snake). It also contains many species of woody and herbaceous plants, including boxwood and olive trees, which account for 60% of the total identified species in the country. According to the country profile related to biodiversity of wildlife in Djibouti, the nation contains more than 820 species of plants, 493 species of invertebrates, 455 species of fish, 40 species of reptiles, 3 species of amphibians, 360 species of birds and 66 species of mammals. Wildlife of Djibouti is also listed as part of Horn of Africa biodiversity hotspot and the Red Sea and Gulf of Aden coral reef hotspot. Mammals include several species of antelope, such as Soemmerring's gazelle and Pelzeln's gazelle. As a result of the hunting ban imposed since early 1970 these species are well conserved now. Other characteristic mammals are Grevy's zebra, hamadryas baboon and Hunter's antelope. The warthog, a vulnerable species, is also found in the Day National park. The coastal waters have dugongs and Abyssinian genet; the latter needs confirmation by further studies. Green turtles and hawksbill turtles are in the coastal waters where nestling also takes place. The Northeast African cheetah Acinonyx jubatus soemmeringii is thought to be extinct in Djibouti. Djibouti's economy is largely concentrated in the service sector. Commercial activities revolve around the country's free trade policies and strategic location as a Red Sea transit point. Due to limited rainfall, vegetables and fruits are the principal production crops, and other food items require importation. The GDP (purchasing power parity) in 2013 was estimated at $2.505 billion, with a real growth rate of 5% annually. Per capita income is around $2,874 (PPP). 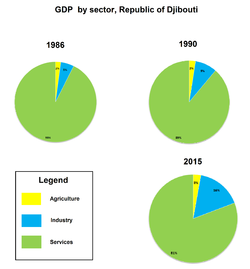 The services sector constituted around 79.7% of the GDP, followed by industry at 17.3%, and agriculture at 3%. As of 2013[update], the container terminal at the Port of Djibouti handles the bulk of the nation's trade. About 70% of the seaport's activity consists of imports to and exports from neighboring Ethiopia, which depends on the harbour as its main maritime outlet. The port also serves as an international refueling center and transshipment hub. In 2012, the Djiboutian government in collaboration with DP World started construction of the Doraleh Container Terminal, a third major seaport intended to further develop the national transit capacity. A $396 million project, it has the capacity to accommodate 1.5 million twenty foot container units annually. Djibouti was ranked the 177th safest investment destination in the world in the March 2011 Euromoney Country Risk rankings. To improve the environment for direct foreign investment, the Djibouti authorities in conjunction with various non-profit organizations have launched a number of development projects aimed at highlighting the country's commercial potential. The government has also introduced new private sector policies targeting high interest and inflation rates, including relaxing the tax burden on enterprises and allowing exemptions on consumption tax. 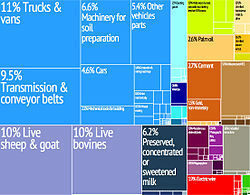 A proportional representation of Djibouti's exports. Additionally, efforts have been made to lower the estimated 60% urban unemployment rate by creating more job opportunities through investment in diversified sectors. Funds have especially gone toward building telecommunications infrastructure and increasing disposable income by supporting small businesses. Owing to its growth potential, the fishing and agro-processing sector, which represents around 15% of GDP, has also enjoyed rising investment since 2008. To expand the modest industrial sector, a 56 megawatt geothermal power plant slated to be completed by 2018 is being constructed with the help of OPEC, the World Bank and the Global Environmental Facility. The facility is expected to solve the recurring electricity shortages, decrease the nation's reliance on Ethiopia for energy, reduce costly oil imports for diesel-generated electricity, and thereby buttress the GDP and lower debt. The Djibouti firm Salt Investment (SIS) began a large-scale operation to industrialize the plentiful salt in Djibouti's Lake Assal region. Operating at an annual capacity of 4 million tons, the desalination project has lifted export revenues, created more job opportunities, and provided more fresh water for the area's residents. In 2012, the Djibouti government also enlisted the services of the China Harbor Engineering Company Ltd for the construction of an ore terminal. Worth $64 million, the project is scheduled to be completed within two years[when?] and will enable Djibouti to export a further 5,000 tons of salt per year to markets in Southeast Asia. 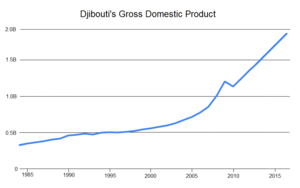 Djibouti's gross domestic product expanded by an average of more than 6 percent per year, from US$341 million in 1985 to US$1.5 billion in 2015. Djibouti's gross domestic product expanded by an average of more than 6 percent per year, from US$341 million in 1985 to US$1.5 billion in 2015. The Djiboutian franc is the currency of Djibouti. It is issued by the Central Bank of Djibouti, the country's monetary authority. Since the Djiboutian franc is pegged to the U.S. dollar, it is generally stable and inflation is not a problem. This has contributed to the growing interest in investment in the country. As of 2010[update], 10 conventional and Islamic banks operate in Djibouti. Most arrived within the past few years, including the Somali money transfer company Dahabshiil and BDCD, a subsidiary of Swiss Financial Investments. The banking system had previously been monopolized by two institutions: the Indo-Suez Bank and the Commercial and Industrial Bank (BCIMR). To assure a robust credit and deposit sector, the government requires commercial banks to maintain 30% of shares in the financial institution;[clarification needed] a minimum of 300 million Djiboutian francs in up-front capital is mandatory for international banks. Lending has likewise been encouraged by the creation of a guarantee fund, which allows banks to issue loans to eligible small- and medium-sized businesses without first requiring a large deposit or other collateral. Saudi investors are also reportedly exploring the possibility of linking the Horn of Africa with the Arabian Peninsula via a 28.5-kilometre-long (17.7 mi) oversea bridge through Djibouti, referred to as the Bridge of the Horns. The investor Tarek bin Laden has been linked to the project. However, it was announced in June 2010 that Phase I of the project had been delayed. Main Terminal at Djibouti–Ambouli International Airport. 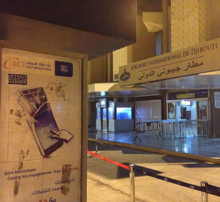 The Djibouti–Ambouli International Airport in Djibouti City, the country's only international airport, serves many intercontinental routes with scheduled and chartered flights. Air Djibouti is the flag carrier of Djibouti and is the country's largest airline. The new and electrified standard gauge Addis Ababa-Djibouti Railway started operation in January 2018. Its main purpose is to facilitate freight services between the Ethiopian hinterland and the Djiboutian Port of Doraleh. Car ferries pass the Gulf of Tadjoura from Djibouti City to Tadjoura. There is the Port of Doraleh west of Djibouti City, which is the main port of Djibouti. The Port of Doraleh is the terminal of the new Addis Ababa–Djibouti Railway. In addition to the Port of Doraleh, which handles general cargo and oil imports, Djibouti currently (2018) has three other major ports for the import and export of bulk goods and livestock, the Port of Tadjourah (potash), the Damerjog Port (livestock) and the Port of Goubet (salt). Almost 95 % of Ethiopia's imports and exports move through Djiboutian ports. The Djiboutian highway system is named according to the road classification. Roads that are considered primary roads are those that are fully asphalted (throughout their entire length) and in general they carry traffic between all the major towns in Djibouti. The Djibouti Telecom headquarters in Djibouti City. Telecommunications in Djibouti fall under the authority of the Ministry of Communication. Djibouti Telecom is the sole provider of telecommunication services. It mostly utilizes a microwave radio relay network. A fiber-optic cable is installed in the capital, whereas rural areas are connected via wireless local loop radio systems. Mobile cellular coverage is primarily limited to the area in and around Djibouti city. As of 2015[update], 23,000 telephone main lines and 312,000 mobile/cellular lines were in use. The SEA-ME-WE 3 submarine cable operates to Jeddah, Suez, Sicily, Marseille, Colombo, Singapore and beyond. Telephone satellite earth stations include 1 Intelsat (Indian Ocean) and 1 Arabsat. Medarabtel is the regional microwave radio relay telephone network. Radio Television of Djibouti is the state-owned national broadcaster. It operates the sole terrestrial TV station, as well as the two domestic radio networks on AM 1, FM 2, and shortwave 0. Licensing and operation of broadcast media is regulated by the government. Movie theaters include the Odeon Cinema in the capital. As of 2012[update], there were 215 local internet service providers. Internet users comprised around 99,000 individuals (2015). The internet country top-level domain is .dj. Arta Plage on the Gulf of Tadjoura. Tourism in Djibouti is one of the growing economic sectors of the country and is an industry that generates less than 80,000 arrivals per year, mostly the family and friends of the soldiers stationed in the country's major naval bases. Although the numbers are on the rise, there are talks of the visa on arrival being stopped, which could limit tourism growth. Infrastructure makes it difficult for tourists to travel independently and costs of private tours are high. Since the re-opening of the train line from Addis Ababa to Djibouti in January 2018, travel by land has also resumed. Djibouti's two main geological marvels, Lake Abbe and Lake Assal, are the country's top tourist destinations. The two sights draw hundreds of tourists every year looking for remote places that are not visited by many. Djibouti has an installed electrical power generating capacity of 126 MW from fuel oil and diesel plants. In 2002 electrical power output was put at 232 GWh, with consumption at 216 GWh. At 2015, per capita annual electricity consumption is about 330 kilowatt-hours (kWh); moreover, about 45% of the population does not have access to electricity, and the level of unmet demand in the country's power sector is significant. Increased hydropower imports from Ethiopia, which currently satisfies 65% of Djibouti's demand, will play a significant role in boosting the country's renewable energy supply. 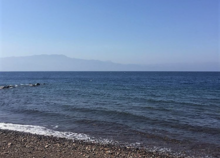 The geothermal potential has generated particular interest in Japan, with 13 potential sites; they have already started the construction on one site near Lake Assal. The construction of the photovoltaic power station (solar farms) in Grand Bara will generated 50 MW capacity. 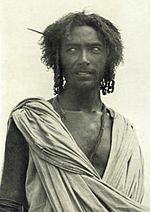 An Afar man in nomadic attire. Djibouti has a population of about 942,333 inhabitants. It is a multiethnic country. The local population grew rapidly during the latter half of the 20th century, increasing from about 83,000 in 1960 to around 846,000 by 2016. The two largest ethnic groups are the Somali (60%) and the Afar (35%). The Somali clan component is mainly composed of the Issas sub-clan of the larger Dir, with smaller Gadabuursi Dir and Isaaq dir The remaining 5% of Djibouti's population primarily consists of Yemeni Arabs, Ethiopians and Europeans (French and Italians). Approximately 76% of local residents are urban dwellers; the remainder are pastoralists. Djibouti also hosts a number of immigrants and refugees from neighboring states, with Djibouti City nicknamed the "French Hong Kong in the Red Sea" due to its cosmopolitan urbanism. Djibouti is a multilingual nation. The majority of local residents speak Somali (524,000 speakers) and Afar (306,000 speakers) as first languages. These idioms are the mother tongues of the Somali and Afar ethnic groups, respectively. Both languages belong to the larger Afroasiatic (Cushitic) family. There are three official languages in Djibouti: Somali, Arabic and French. Arabic is of religious importance. In formal settings, it consists of Modern Standard Arabic. Colloquially, about 59,000 local residents speak the Ta'izzi-Adeni Arabic dialect, also known as Djibouti Arabic. French serves as a statutory national language. It was inherited from the colonial period, and is the primary language of instruction. Around 17,000 Djiboutians speak it as a first language. Immigrant languages include Omani Arabic (38,900 speakers), Amharic (1,400 speakers), Greek (1,000 speakers) and Hindi (600 speakers). Djibouti's population is predominantly Muslim. Islam is observed by around 94% of the nation's population (approximately 740,000 as of 2012[update]), whereas the remaining 6% of residents are Christian adherents. Islam entered the region very early on, as a group of persecuted Muslims had sought refuge across the Red Sea in the Horn of Africa at the urging of the Islamic prophet Muhammad. In 1900, during the early part of the colonial era, there were virtually no Christians in the territories, with only about 100–300 followers coming from the schools and orphanages of the few Catholic missions in the French Somaliland. The Constitution of Djibouti names Islam as the sole state religion, and also provides for the equality of citizens of all faiths (Article 1) and freedom of religious practice (Article 11). Most local Muslims adhere to the Sunni denomination, following the Shafi'i school. The non-denominational Muslims largely belong to Sufi orders of varying schools. According to the International Religious Freedom Report 2008, while Muslim Djiboutians have the legal right to convert to or marry someone from another faith, converts may encounter negative reactions from their family and clan or from society at large, and they often face pressure to go back to Islam. The Diocese of Djibouti serves the small local Catholic population, which it estimates numbered around 7,000 individuals in 2006. Entrance to the ISSS Faculty of Medicine in Djibouti City. The life expectancy at birth is around 63.2 for both males and females. Fertility is at 2.35 children per woman. In Djibouti there are about 18 doctors per 100,000 persons. The 2010 maternal mortality rate per 100,000 births for Djibouti is 300. This is compared with 461.6 in 2008 and 606.5 in 1990. The under 5 mortality rate, per 1,000 births is 95 and the neonatal mortality as a percentage of under 5's mortality are 37. In Djibouti the number of midwives per 1,000 live births is 6 and the lifetime risk of death for pregnant women 1 in 93. About 93.1% of Djibouti's women and girls have undergone female genital mutilation (female circumcision), a pre-marital custom mainly endemic to Northeast Africa and parts of the Near East]. Although legally proscribed in 1994, the procedure is still widely practiced, as it is deeply ingrained in the local culture. Encouraged and performed by women in the community, circumcision is primarily intended to deter promiscuity and to offer protection from assault. About 94% of Djibouti's male population have also reportedly undergone male circumcision. Education is a priority for the government of Djibouti. As of 2009[update], it allocates 20.5% of its annual budget to scholastic instruction. 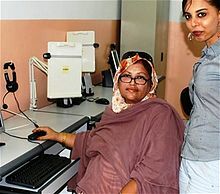 Djiboutian women participating in the Global Pulse educational initiative (2010). The Djiboutian educational system was initially formulated to cater to a limited pupil base. As such, the schooling framework was largely elitist and drew considerably from the French colonial paradigm, which was ill-suited to local circumstances and needs. In the late 1990s, the Djiboutian authorities revised the national educational strategy and launched a broad-based consultative process involving administrative officials, teachers, parents, national assembly members and NGOs. The initiative identified areas in need of attention and produced concrete recommendations on how to go about improving them. The government subsequently prepared a comprehensive reform plan aimed at modernizing the educational sector over the 2000–10 period. In August 2000, it passed an official Education Planning Act and drafted a medium-term development plan for the next five years. The fundamental academic system was significantly restructured and made compulsory; it now consists of five years of primary school and four years of middle school. Secondary schools also require a Certificate of Fundamental Education for admission. In addition, the new law introduced secondary-level vocational instruction and established university facilities in the country. As a result of the Education Planning Act and the medium-term action strategy, substantial progress has been registered throughout the educational sector. In particular, school enrollment, attendance, and retention rates have all steadily increased, with some regional variation. From 2004 to 2005 to 2007–08, net enrollments of girls in primary school rose by 18.6%; for boys, it increased 8.0%. Net enrollments in middle school over the same period rose by 72.4% for girls and 52.2% for boys. At the secondary level, the rate of increase in net enrollments was 49.8% for girls and 56.1% for boys. The Djiboutian government has especially focused on developing and improving institutional infrastructure and teaching materials, including constructing new classrooms and supplying textbooks. At the post-secondary level, emphasis has also been placed on producing qualified instructors and encouraging out-of-school youngsters to pursue vocational training. As of 2012[update], the literacy rate in Djibouti was estimated at 70%. Institutions of higher learning in the country include the University of Djibouti. Traditional wood-carved jar from Oue'a in the Tadjourah region. Djiboutian attire reflects the region's hot and arid climate. When not dressed in Western clothing such as jeans and T-shirts, men typically wear the macawiis, which is a traditional sarong-like garment worn around the waist. Many nomadic people wear a loosely wrapped white cotton robe called a tobe that goes down to about the knee, with the end thrown over the shoulder (much like a Roman toga). Women typically wear the dirac, which is a long, light, diaphanous voile dress made of cotton or polyester that is worn over a full-length half-slip and a bra. Married women tend to sport head-scarves referred to as shash and often cover their upper body with a shawl known as garbasaar. Unmarried or young women, however, do not always cover their heads. Traditional Arabian garb such as the male jellabiya (jellabiyaad in Somali) and the female jilbāb is also commonly worn. For some occasions such as festivals, women may adorn themselves with specialized jewelry and head-dresses similar to those worn by the Berber tribes of the Maghreb. A lot of Djibouti's original art is passed on and preserved orally, mainly through song. Many examples of Islamic, Ottoman, and French influences can also be noted in the local buildings, which contain plasterwork, carefully constructed motifs, and calligraphy. The oud is a common instrument in traditional Djibouti music. Somalis have a rich musical heritage centered on traditional Somali folklore. Most Somali songs are pentatonic. That is, they only use five pitches per octave in contrast to a heptatonic (seven note) scale such as the major scale. At first listen, Somali music might be mistaken for the sounds of nearby regions such as Ethiopia, Sudan or the Arabian Peninsula, but it is ultimately recognizable by its own unique tunes and styles. Somali songs are usually the product of collaboration between lyricists (midho), songwriters (laxan) and singers (codka or "voice"). Balwo is a Somali musical style centered on love themes that is popular in Djibouti. Traditional Afar music resembles the folk music of other parts of the Horn of Africa such as Ethiopia; it also contains elements of Arabic music. The history of Djibouti is recorded in the poetry and songs of its nomadic people, and goes back thousands of years to a time when the peoples of Djibouti traded hides and skins for the perfumes and spices of ancient Egypt, India and China. Afar oral literature is also quite musical. It comes in many varieties, including songs for weddings, war, praise and boasting. Djibouti has a long tradition of poetry. Several well-developed Somali forms of verse include the gabay, jiifto, geeraar, wiglo, buraanbur, beercade, afarey and guuraw. The gabay (epic poem) has the most complex length and meter, often exceeding 100 lines. It is considered the mark of poetic attainment when a young poet is able to compose such verse, and is regarded as the height of poetry. Groups of memorizers and reciters (hafidayaal) traditionally propagated the well-developed art form. Poems revolve around several main themes, including baroorodiiq (elegy), amaan (praise), jacayl (romance), guhaadin (diatribe), digasho (gloating) and guubaabo (guidance). The baroorodiiq is composed to commemorate the death of a prominent poet or figure. The Afar are familiar with the ginnili, a kind of warrior-poet and diviner, and have a rich oral tradition of folk stories. They also have an extensive repertoire of battle songs. Additionally, Djibouti has a long tradition of Islamic literature. Among the most prominent historical works is the medieval Futuh Al-Habash by Shihāb al-Dīn, which chronicles the Adal Sultanate army's conquest of Abyssinia during the 16th century. In recent years, a number of politicians and intellectuals have also penned memoirs or reflections on the country. Football is the most popular sport amongst Djiboutians. The country became a member of FIFA in 1994, but has only taken part in the qualifying rounds for the African Cup of Nations as well as the FIFA World Cup in the mid-2000s. In November 2007, the Djibouti national football team beat Somalia's national squad 1–0 in the qualification rounds for the 2010 FIFA World Cup, marking its first ever World Cup-related win. Recently, new sports are developing and being introduced, such as Archery. World Archery Federation has helped to implement the Djibouti Archery Federation, and an international archery training center is being created in Arta to support archery development in East Africa and Red Sea area. 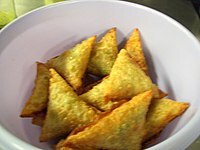 A plate of sambusas a popular traditional snack. Djiboutian cuisine is a mixture of Somali, Afar, Yemeni, and French cuisine, with some additional South Asian (especially Indian) culinary influences. Local dishes are commonly prepared using a lot of Middle Eastern spices, ranging from saffron to cinnamon. Grilled Yemeni fish, opened in half and often cooked in tandoori style ovens, are a local delicacy. Spicy dishes come in many variations, from the traditional Fah-fah or "Soupe Djiboutienne" (spicy boiled beef soup), to the yetakelt wet (spicy mixed vegetable stew). Xalwo (pronounced "halwo") or halva is a popular confection eaten during festive occasions, such as Eid celebrations or wedding receptions. Halva is made from sugar, corn starch, cardamom powder, nutmeg powder and ghee. Peanuts are sometimes added to enhance texture and flavor. After meals, homes are traditionally perfumed using incense (cuunsi) or frankincense (lubaan), which is prepared inside an incense burner referred to as a dabqaad. ^ "Djibouti's Constitution of 1992 with Amendments through 2010" (PDF). Government of DJibouti. p. 3. Archived (PDF) from the original on 25 June 2016. Retrieved 15 December 2017. ^ a b c d e f g h i j k l m n o p q r s t u v w x y "Djibouti". The World Factbook. CIA. 5 February 2013. Archived from the original on 2 July 2014. Retrieved 26 February 2013. ^ "Freedom in the World 2018 – Djibouti". freedomhouse.org. Freedomhouse. 4 January 2018. Archived from the original on 8 October 2018. Retrieved 7 October 2018. ^ Norman, Joshua. "The world's enduring dictators: Ismael Omar Guelleh, Djibouti". CBS News (11 June 2011, 4:55 PM). CBS News. cbsnews.com. Archived from the original on 17 August 2018. Retrieved 7 October 2018. ^ a b c d "Djibouti". International Monetary Fund. Archived from the original on 11 November 2018. Retrieved 30 October 2018. ^ Selima., Jāhāna, (2015). Work for human development (PDF). Human Development Report. United Nations Development Programme. p. 232. ISBN 9789211263985. OCLC 936070939. Archived (PDF) from the original on 22 December 2015. Retrieved 15 September 2018. ^ a b Raph Uwechue, Africa year book and who's who, (Africa Journal Ltd.: 1977), p.209. ^ a b Chisholm, Hugh, ed. (1911). "Somaliland: History of French Somaliland" . Encyclopædia Britannica. 25 (11th ed.). Cambridge University Press. p. 383. ^ a b c A Political Chronology of Africa, (Taylor & Francis), p.132. ^ Chisholm, Hugh, ed. (1911). "Zaila" . Encyclopædia Britannica. 28 (11th ed.). Cambridge University Press. p. 950. ^ "Today in Djibouti History". Historyorb.com. Archived from the original on 16 May 2011. Retrieved 27 April 2011. ^ "United Nations member states". United Nations. Archived from the original on 30 December 2013. Retrieved 27 April 2011. ^ Everett-Heath, John. "The Concise Dictionary of World Place-Names (3 ed.)". Oxford Reference. Oxford Reference. Archived from the original on 6 March 2019. Retrieved 5 March 2019. ^ Boujrada, Zineb (2 March 2018). "How Djibouti Got Its Unique Name". The Culture Trip. Archived from the original on 6 March 2019. Retrieved 4 March 2019. ^ Blench, R. (2006). Archaeology, Language, and the African Past. Rowman Altamira. pp. 143–144. ISBN 978-0759104662. Archived from the original on 14 September 2014. Retrieved 8 September 2014. ^ Walter Raunig, Steffen Wenig (2005). Afrikas Horn. Otto Harrassowitz Verlag. p. 439. ISBN 978-3447051750. Archived from the original on 14 September 2014. Retrieved 7 September 2014. ^ Connah, Graham (2004). Forgotten Africa: An Introduction to Its Archaeology. Routledge. p. 46. ISBN 978-1134403035. Archived from the original on 14 September 2014. Retrieved 7 September 2014. ^ Universität Frankfurt am Main (2003). Journal of African Archaeology, Volumes 1–2. Africa Manga Verlag. p. 230. ISBN 9783937248004. Archived from the original on 14 September 2014. Retrieved 7 September 2014. ^ Finneran, Niall (2013). The Archaeology of Ethiopia. 1136755527: Routledge. p. 86. ISBN 978-1136755521. Retrieved 29 December 2016. ^ Fattovich, Rodolfo (1987). "Some remarks on the origins of the Aksumite Stelae". Annales d'Éthiopie. 14 (14): 43–69. Archived from the original on 4 June 2018. Retrieved 30 October 2018. ^ "A Country Study: Somalia from The Library of Congress". Lcweb2.loc.gov. Archived from the original on 9 January 2009. Retrieved 27 April 2011. ^ Melton, J. Gordon and Baumann, Martin (2010) Religions of the World, Second Edition: A Comprehensive Encyclopedia of Beliefs and Practices. ABC-CLIO. p. 2663. ISBN 1598842048. ^ Jalata, Asafa (2004) State Crises, Globalisation, And National Movements in North-east Africa. Routledge. pp. 3–4. ISBN 0415348102. ^ Briggs, Phillip (2012). Somaliland. Bradt Travel Guides. p. 7. ISBN 978-1841623719. Archived from the original on 12 October 2014. Retrieved 21 December 2016. ^ a b Encyclopedia Americana, Volume 25. Americana Corporation. 1965. p. 255. Archived from the original on 10 June 2014. Retrieved 21 December 2016. ^ a b Lewis, I.M. (1955). Peoples of the Horn of Africa: Somali, Afar and Saho. International African Institute. p. 140. Archived from the original on 6 August 2016. Retrieved 21 December 2016. ^ Cahoon, Ben. "Djibouti". Worldstatesmen.org. Archived from the original on 6 April 2011. Retrieved 27 April 2011. ^ Africa Research, Ltd (1966). Africa Research Bulletin, Volume 3. Blackwell. p. 597. Archived from the original on 30 January 2015. Retrieved 18 December 2014. ^ American Universities Field Staff (1968) Northeast Africa series, Volume 15, Issue 1, p. 3. ^ Legion-Etrangere. Legion-Etrangere. 2000. p. 2. Archived from the original on 30 July 2017. Retrieved 3 May 2017. ^ Cottrell, Alvin J. and Burrell, Robert Michael (1972) The Indian Ocean: its political, economic, and military importance. Praeger. p. 166. ^ Newsweek, Volume 81, (Newsweek: 1973), p. 254. ^ a b c d "Djibouti's Constitution of 1992 with Amendments through 2010" (PDF). Constitute. Archived (PDF) from the original on 25 June 2016. Retrieved 19 July 2016. ^ a b c d "Constitution de la République de Djibouti" (in French). Agence Djiboutienne d'Information. Archived from the original on 25 November 2012. Retrieved 30 March 2013. ^ a b "Djibouti". Freedom House. 17 January 2012. Archived from the original on 25 October 2012. Retrieved 30 March 2013. ^ a b "DJIBOUTI: Guelleh sworn in for second presidential term". IRIN Africa. 9 May 2005. Archived from the original on 29 November 2006. Retrieved 20 March 2013. ^ "Elections in Djibouti". African Elections Database. Archived from the original on 2 January 2017. Retrieved 30 March 2013. ^ a b "Djibouti validates presidential election". Middle East Online. 13 April 2011. Archived from the original on 2 June 2013. Retrieved 30 March 2013. ^ "Sudan: President Al-Bashir Congratulates Djibouti President On His Re-Election". Sudan News Agency. 20 April 2011. Retrieved 30 March 2013. ^ "Joint statement of the international observer missions of the Djibouti presidential elections held on April 08, 2011". Intergovernmental Authority on Development. 10 April 2011. Archived from the original on 16 June 2013. Retrieved 30 March 2013. In view of the foregoing, the international mission found that the election of 8 April 2011 was peaceful, calm, fair, transparent and took place in dignity. It declares that the election was free and democratic. ^ "M. Abdoulkader Kamil Mohamed, grand commis de l'Etat et nouveau Premier ministre djiboutien". Adjib. Archived from the original on 1 January 2014. Retrieved 1 April 2013. ^ "Djibouti government reaches deal to bring opposition into parliament". Goobjoog. 30 December 2014. Archived from the original on 1 January 2015. Retrieved 1 January 2015. ^ Freedom House (2011). "Freedom in the World 2011: Djibouti". Freedom House. Archived from the original on 7 March 2013. Retrieved 6 August 2012. ^ Peligal, Rona (17 February 2011). "Djibouti: Call to Drop Charges and Release Jean-Paul Noël Abdi, President of the Djiboutian League of Human Rights (Letter to His Excellency Ismail Omar Guelleh, President of the Republic of Djibouti)". Human Rights Watch. Archived from the original on 4 August 2012. Retrieved 6 August 2012. ^ "Djibouti: Further information: Activist released but charges remain: Jean-Paul Noel Abdi". Amnesty International. 23 February 2011. Archived from the original on 6 March 2012. Retrieved 6 August 2012. ^ "Somalia: UN Envoy Says Inauguration of New Parliament in Somalia 'Historic Moment'". Forum on China-Africa Cooperation. 21 August 2012. Archived from the original on 14 October 2012. Retrieved 24 August 2012. ^ Mohamed, Mahmoud (17 September 2012). "Presidential inauguration ushers in new era for Somalia". Sabahi. Archived from the original on 22 October 2012. Retrieved 30 September 2012. ^ Murithi, Tim (1993). Handbook of Africa's International Relations. Routledge. p. 98. ISBN 978-1136636967. Retrieved 24 September 2016. ^ "Djibouti Is Hot". Bloomberg.com. Archived from the original on 4 October 2017. Retrieved 19 September 2017. ^ a b c Jacobs, Andrew; Perlez, Jane (25 February 2017). "U.S. Wary of Its New Neighbor in Djibouti: A Chinese Naval Base". The New York Times. Archived from the original on 14 May 2017. Retrieved 17 May 2017. ^ "The Expansion of the Japan Self-Defense Force Base in Djibouti | defenceWeb". Archived from the original on 10 December 2017. Retrieved 9 December 2017. ^ Styan, David (April 2013). "Djibouti: Changing Influence in the Horn's Strategic Hub" (PDF). Chatham House. Archived (PDF) from the original on 26 November 2013. Retrieved 15 August 2018. ^ Chandran, Nyshka (27 June 2018). "China increases defense ties with Africa". www.cnbc.com. Archived from the original on 16 December 2018. Retrieved 14 December 2018. ^ Manighetti, Isabelle; Tapponnier, Paul; Courtillot, Vincent; Gruszow, Sylvie; Gillot, Pierre-Yves (1997). "Propagation of rifting along the Arabia‐Somalia plate boundary: The gulfs of Aden and Tadjoura". Journal of Geophysical Research: Solid Earth. 102: 2681–2710. doi:10.1029/96JB01185. ^ Geothermal Resources Council (1985). 1985 International Symposium on Geothermal Energy, Volume 9, Part 1. p. 175. ^ "Eritrean coastal desert". Terrestrial Ecoregions. World Wildlife Fund. ^ a b "Weatherbase : Djibouti". Archived from the original on 5 September 2015. Retrieved 1 July 2015. ^ "Djibouti to source 100% of its energy from renewables by 2020". climateactionprogramme.org. Archived from the original on 20 July 2015. Retrieved 29 May 2015. ^ a b "Le Pèlerin du Day". World Food Programme. Archived from the original on 20 March 2012. Retrieved 27 February 2013. ^ "Djibouti". Living National Treasures. Archived from the original on 3 August 2013. Retrieved 27 February 2013. ^ International Union for Conservation of Nature and Natural Resources; Norway. Direktoratet for utviklingshjelp (December 1989). The IUCN Sahel studies 1989. IUCN. pp. 95, 104. ISBN 978-2-88032-977-8. Archived from the original on 1 January 2014. Retrieved 28 May 2011. ^ S. N. Stuart; Richard J. Adams (1990). Biodiversity in Sub-Saharan Africa and its Islands: Conservation, Management and Sustainable Use. IUCN. pp. 81–82. ISBN 978-2-8317-0021-2. Retrieved 28 May 2011. ^ a b c d e f g h Bansal, Ridhima (23 September 2011). "Current Development Projects and Future Opportunities in Djibouti". Association of African Entrepreneurs. Archived from the original on 27 March 2013. Retrieved 26 February 2013. ^ "Euromoney Country Risk". Euromoney Institutional Investor PLC. Archived from the original on 30 July 2011. Retrieved 15 August 2011. ^ "Djibouti, China Sign 64 mln USD Agreement to Facilitate Salt Export". Xinhua News Agency. 20 November 2012. Archived from the original on 24 February 2014. Retrieved 27 February 2013. ^ a b "Djibouti banking boom attracts foreign investors". Reuters. 23 March 2010. Archived from the original on 26 May 2013. Retrieved 27 February 2013. ^ "Bridge of the Horns, Cities of Light: Will They Ever Actually Be Built?". The Basement Geographer. WordPress. 27 June 2011. Archived from the original on 28 August 2013. Retrieved 1 September 2015. ^ "Phase I of Yemen and Djibouti Causeway delayed". Steelguru.com. 22 June 2010. Archived from the original on 5 April 2016. Retrieved 24 March 2016. ^ "Chiefs of State and Cabinet Members of Foreign Governments". CIA. Archived from the original on 21 December 2016. Retrieved 23 November 2016. 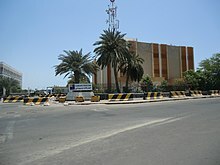 ^ "Movie theaters in Djibouti, Djibouti". Cinema Treasures. Archived from the original on 24 November 2016. Retrieved 24 November 2016. ^ "African Nation of Djibouti banks on Chinese tourists". South China Morning Post. 17 April 2017. Archived from the original on 14 March 2018. ^ "Ethiosport launch of the train to Djibouti". ethiosports.com. 1 January 2018. Archived from the original on 14 March 2018. Retrieved 14 March 2018. ^ "Things to do in Djibouti". onceinalifetimejourney. 14 March 2018. Archived from the original on 14 March 2018. Retrieved 14 March 2018. ^ a b c "Diversification key to expansion of Djibouti's energy sector". Oxford Business Group. 16 March 2016. Archived from the original on 3 November 2017. Retrieved 25 February 2018. ^ "Djibouti Population". World Bank. Archived from the original on 26 October 2015. Retrieved 26 October 2015. ^ a b "Djibouti – Languages". Ethnologue. Archived from the original on 10 September 2016. Retrieved 6 September 2016. ^ United Nations High Commissioner for Refugees. "Immigration and Refugee Board of Canada, "Djibouti: Situation and treatment of Christians, including instances of discrimination or violence; effectiveness of recourse available in cases of mistreatment; problems that a Muslim can face if he or she converts to Christianity or marries a Christian (2000–2009)", 5 August 2009". Unhcr.org. Archived from the original on 10 May 2011. Retrieved 20 June 2010. ^ Cheney, David M. "Diocese of Djibouti". Catholic-hierarchy.org. Archived from the original on 12 March 2013. Retrieved 28 February 2013. 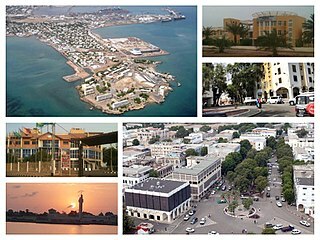 ^ "Djibouti: Regions, Major Cities & Towns - Population Statistics, Maps, Charts, Weather and Web Information". citypopulation.de. ^ "Republic of Djibouti: Humanitarian Country Profile". IRIN. February 2007. Archived from the original on 17 February 2010. Retrieved 20 June 2010. ^ "The State of the World's Midwifery". United Nations Population Fund. Archived from the original on 21 January 2012. Retrieved 1 August 2011. ^ "Prevalence of FGM". Who.int. 9 December 2010. Archived from the original on 23 April 2011. Retrieved 27 April 2011. ^ Hayes, Rose Oldfield (1975). "Female genital mutilation, fertility control, women's roles, and the patrilineage in modern Sudan: a functional analysis". American Ethnologist. 2 (4): 617–633. doi:10.1525/ae.1975.2.4.02a00030. ^ Bodman, Herbert L. and Tohidi, Nayereh Esfahlani (1998) Women in Muslim societies: diversity within unity Archived 5 September 2015 at the Wayback Machine. Lynne Rienner Publishers. p. 41. ISBN 1555875785. ^ a b "DJIBOUTI: Women fight mutilation". IRIN. 12 July 2005. Archived from the original on 16 May 2011. Retrieved 27 April 2011. ^ Suzanne G. Frayser, Thomas J. Whitby, Studies in human sexuality: a selected guide Archived 5 September 2015 at the Wayback Machine, (Libraries Unlimited: 1995), p. 257 ISBN 1563081318. ^ Eric Werker; Amrita Ahuja; Brian Wendell. "Male Circumcision and AIDS: The Macroeconomic Impact of a Health Crisis" (PDF). NEUDC 2007 Papers :: Northeast Universities Development Consortium Conference: Center for International Development at Harvard Un. Archived (PDF) from the original on 19 July 2011. Retrieved 27 April 2011. ^ Compact Atlas of the World. Penguin. 2012. p. 138. ISBN 978-0756698591. Archived from the original on 11 October 2014. Retrieved 20 February 2016. 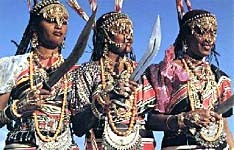 ^ "Image of Djibouti women in head-dresses". discoverfrance.net. Archived from the original on 14 June 2007. Retrieved 31 May 2007. This article incorporates public domain material from the CIA World Factbook document "2016 edition". "Site Officiel de la République de Djibouti" [Official website of the Republic of Djibouti] (in French). Government of Djibouti. "Office National de Tourisme de Djibouti". National Official of Tourism of Djibouti. "Djibouti". The World Factbook. Central Intelligence Agency. The Djibouti Armed Forces (DJAF) are the military forces of Djibouti. They consist of the Djiboutian Army and its sub-branches the Djibouti Air Force and Djiboutian Navy. As of 2018, the Djibouti Armed Forces consists of 20,470 ground troops, which are divided into several regiments and battalions garrisoned in various areas throughout the country. Djibouti Armed Forces are an important player in the Bab-el-Mandeb and Red Sea. Dileita Mohamed Dileita is a Djiboutian politician who was the Prime Minister of Djibouti from 7 March 2001 to 1 April 2013. He was Vice-President of the People's Rally for Progress (RPP), the governing political party, until 2012. He also served as President of the Union for the Presidential Majority (UMP), the governing coalition. In June 2014, Dileita was appointed as the African Union's Special Envoy for Libya. The culture of the Republic of Djibouti is diverse, due to the nation's Red Sea location at a crossroads of trade and commerce. Djibouti City is the eponymous capital and largest city of Djibouti. It is located in the coastal Djibouti Region on the Gulf of Tadjoura. The music of Djibouti refers to the musical styles, techniques and sounds of Djibouti. The Gulf of Tadjoura, is a gulf or basin of the Indian Ocean in the Horn of Africa. It lies south of the straits of Bab-el-Mandeb, or the entrance to the Red Sea, at 11.7°N 43.0°E. The gulf has many fishing grounds, extensive coral reefs, and abundant pearl oysters. Most of its coastline is the territory of Djibouti, except for a short stretch on the southern shore, which is part of the territory of Somalia. Djiboutians are the citizens of Djibouti. The country is mainly composed of two ethnic groups, namely the Somali and the Afar. It has many languages though Somali and Afar are the most widely spoken ones, Arabic and French serve as the official languages. The Djiboutian–Eritrean border conflict between the forces of Djibouti and Eritrea occurred between June 10 and June 13, 2008. It was triggered by tension which began on April 16, 2008, when Djibouti reported that Eritrean armed forces had penetrated into Djibouti and dug trenches on both sides of the border. The crisis deepened when armed clashes broke out between the two armed forces in the border area on June 10, 2008. During the conflict, France provided logistical, medical and intelligence support to Djibouti, but did not participate in direct combat. Ali Aref Bourhan was a Djiboutian politician.